Before jumping into the video there are some comments I hope will make learning SketchUp easier. SketchUp is a powerful tool, its learning curve is quick and it can be fun. It can also be frustrating for beginners. To help avoid this frustration, or at least to minimize it, I have developed a few rules that I encourage you to memorize. Or at least memorize the concepts embedded in them. If you commit these concepts to memory you will avoid that desire to give up, that many beginners reach. As you watch the video you should notice that I practice these rules myself. Under the Window menu choose Preferences. Select the General panel and under “Saving” make sure both “Create backup” and “Auto-save” check boxes are checked. Set “Every” to 5 minutes. In addition, get into the habit of saving your file frequently using the File/Save (or File/Save As if it is the first save). You must save your file once before “Create backup” takes effect, so do it immediately upon beginning a model. 3D modeling is a lot of work and loosing multiple hours of work can make you blood curdling angry. Follow this basic rule to avoid hypertension. During the modeling phase, described in Rule 6, make sure that Layer0 is always active. Access the Layers dialog box with menu Window/Layers and make sure the radio button to the left of Layer0 is selected. This should remain true through the entire modeling phase. This ensures that all primitives reside on Layer0. More importantly, that the primitives of a given group or component are not on different layers which would make using Layers to view and hide individual parts nearly impossible. NEVER allow a part in its primitive state touch another part in its primitive state. The word primitive, or primitives, means points, lines, faces, rectangles, circles, polygons and arcs including construction lines and points. In short, a primitive is any drawn object except a solid, group or component. Primitives are the most fundamental of drawing objects from which all other geometry is drawn. A part is in its primitive state unless it is made into a group or component. It is very important to understand that when two primitives touch, even when they are on different layers, they STICK together. Components save time and frustration. In addition, they dramatically reduce the file size of your model. Groups are similar to components but components have several advantages, most importantly reducing file size and efficiency in editing. Avoid groups if possible. A part doesn’t have to be completed before making it a component; in fact it should be made a component as soon as it takes on a 3D shape. Further modeling of the part, or edits to it, can be made later using the protected “Component Edit” or “Group Edit” tools. The best way to move a component to a different layer is by using the Entity Info box. If the desired layer does not exist, use the Layers box to create it and then move the desired component onto the layer. Both the Layers and Entity Info box can be found on the Window menu, including other helpful boxes. Draw a complete model first, including joinery. Be sure all parts are components. All components must have a unique and descriptive Definition Name. All components should have a unique instance (part) Name. This I call the modeling phase. Only when the 3D model is complete should you move on to creating scenes, texturing or dimensioning. Rules 3 and 4 are important because in SketchUp primitives are “sticky”. That is, if they touch one another they stick together, more accurately they share points, edges and faces. Therefore, if table legs and a table top are drawn in their correct position relative to each other, and are in their primitive state, they would be touching. Separating them onto different layers or making them individual components or groups becomes at best frustrating and at worst near impossible. In fact if you tried to move a leg the top would move; worse it would become totally distorted. SketchUp’s sticky nature is one of its most difficult aspects to deal with, unless you follow these rules. Once mastered, drawing parts and converting them to components will become second nature. You will also discover that this sticky nature of SketchUp’s primitives was not perpetrated on the unsuspecting beginners by its developers to inflict hypertension and a nervous breakdown. Rather there is an overriding useful purpose that will be evident as you continue learning. A completed SketchUp model of the Bedside Table can be downloaded from my website srww.com. Select the Free Plans menu button, scroll down to Tables and locate Bedside Table from the list. It is available both in native SketchUp file format (.skp) and as a PDF file (.pdf). Before you view the video take time to familiarize yourself with its design and dimensions. For this third part we are especially interested in the Upper Drawer Rail, Lower Drawer Rail and Top. You may want to print out the Front View, Upper Drawer Rail and Lower Rail scene(s) for reference. Sometimes the performance of your internet connection, the load on it at a particular time of day, and the length of these video tutorials can all conspire to provide you a frustrating and impossible viewing experience. If this happens it may be preferable to download the entire video unto your system and view it on your local video player. The video file is an mp4. It can be viewed with most video players including QuickTime and Media Player. If you have a default, or user specified, file association for .mp4 you may have to delete it or use a download manager to download this file. Otherwise the associated application will be invoked and file streaming will prevail over downloading. There are numerous free download managers on the internet. Be careful, and do some research to locate one that is not loaded with spyware or viruses. You may find it easier to view the video in full screen mode. Start the video before selecting this mode. To enter full screen mode click the little screen icon at the bottom of the video player. When in full screen view hold your cursor near the bottom of the screen to access the video player’s controls. Exit full screen mode with the Esc key. This part is approximately 32 minutes long. Sit back, relax and enjoy the show! 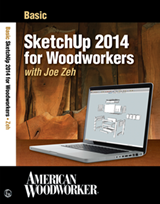 See you in Beginner’s SketchUp Tutorial, The Video Version–Part 4. Almost a year ago I wrote and article titled Chiefwoodworker Takes On An Apprentice. Well, Max didn’t work out so well. He prefers to sleep all day, bark at the machines and tear to shreds any strange visitors to the Swamp Road Wood Works shop. Very messy! Fortunately, a new apprentice showed up at my door one day. When I answered the knock Amber simply said “Hi, are you Joe”? I said “Yes”. 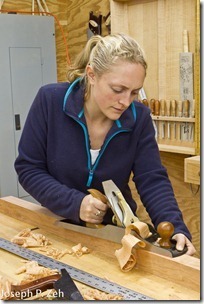 Amber said “I saw your website and realized you have a woodworking shop in Worthington and I live in Worthington. I would like to learn furniture crafting. 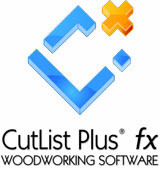 Would you mind if I worked with you to learn fine woodworking?”. It was pretty much that short. I gave her a tour of the shop and we picked a day to start. Her name is Amber Baker, and in the last month or so I have gotten to know her and her ambitions. Amber is comfortable in the shop, not afraid to try any of the power tools, but is also becoming adept at woodworking with hand tools; a way of working that I tend to favor too. Amber began by helping me with my Trundle Bed, learning to take wood from rough cut to final sizing. 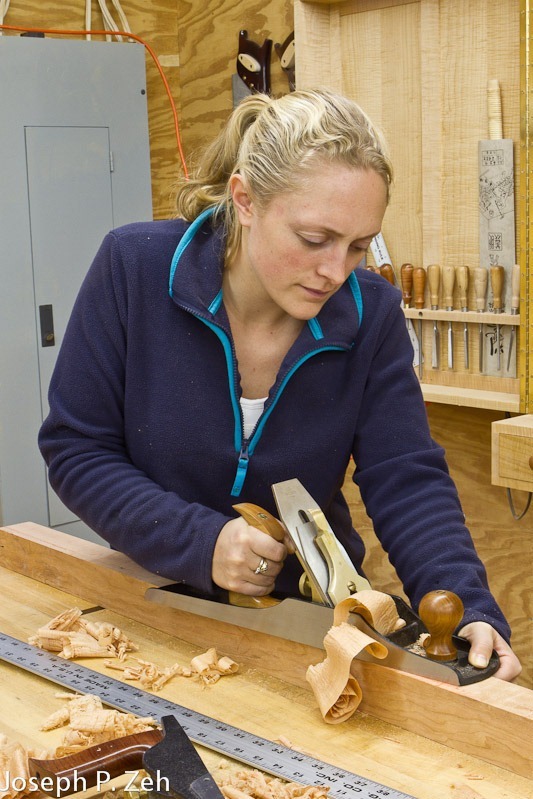 She has learned to craft snug fitting mortise and tenon joints, dry fit milled parts for glue up, gluing, clamping and checking an assembly for square. She has started her own Spice Rack project. The rack will hold 28 pint sized canning jars. Amber drew the Spice Rack shop drawings in SketchUp and prepared all the stock working from a SketchUp cut list. 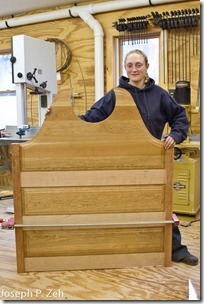 Several of the sides she took from rough stock to finish ready entirely by hand planing. Next week she will cut the dadoes and other joinery and glue it up. Max is still around, kind of retired after a short woodworking career. I must say, Amber is much more productive and far more skilled with the tools. A native to western Massachusetts, Amber has always been drawn to hand crafted arts and learning skills towards living a self sufficient lifestyle. After earning her BS in Environmental Science from UMass Amherst she continued her education at Yestermorrow Design and Build School. There, she earned a certificate in Ecological Landscape Design and Natural Materials Building Methods. While apprentice home-steading in Acworth NH she cut and erected a timber-framed barn with a local carpenter. 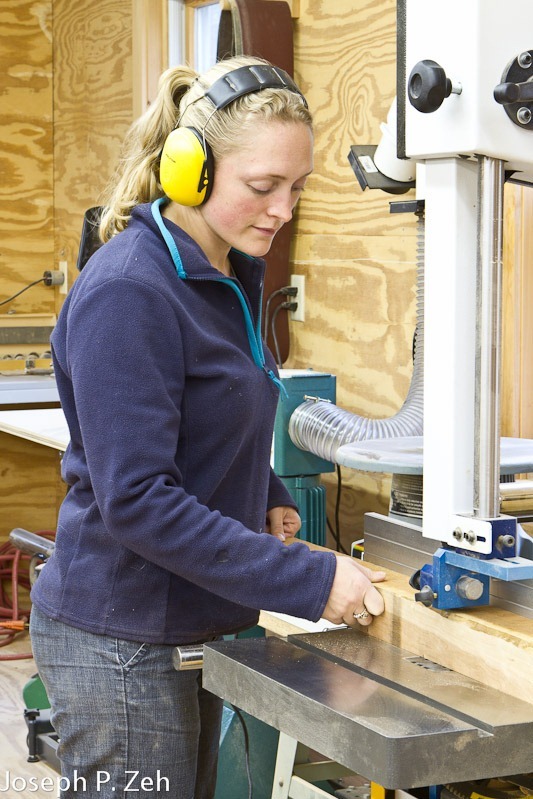 Now she is looking for more detail woodworking skills to round out her experience and set her up to eventually build her own home, frame, stairs, cabinets, furniture and all! I believe Amber will accomplish her goals. From what I have seen so far she is energetic, hard working and relishes a challenge. I hope I and Swamp Road Wood Works can help her in some small way toward that end. Look for some of her work to appear on this blog soon. A completed SketchUp model of the Bedside Table can be downloaded from my website srww.com. Select the Free Plans menu button, scroll down to Tables and locate Bedside Table from the list. It is available both in native SketchUp file format (.skp) and as a PDF file (.pdf). Before you view the video take time to familiarize yourself with its design and dimensions. For this second part we are especially interested in the Legs, Back and Sides. You may want to print out the Front View, Side View, Legs, Back and Sides scene(s) for reference. You may find it easier to view the video in full screen mode. Start the video before selecting this mode. To enter full screen mode click the little screen icon at the bottom of the video player. When in full screen view hold your cursor near the bottom of the screen to access the video player’s controls. Exit full screen mode with the Esc key. This part is approximately 40 minutes long. Sit back, relax and enjoy the show! See you in Beginner’s SketchUp Tutorial, The Video Version–Part 3. Some time ago I wrote a multipart blog titled Drawing A Bedside Table. It was intended to teach beginners how to draw furniture in SketchUp. At the time SkectchUp 6 was the version available. These tutorials still exist and you can find them on my Google SketchUp page under the heading Beginner’s SketchUp Tutorial. Recently Google SketchUp 8 was introduced and I pondered updating these tutorials. As I thought about it, a better idea came to mind; I decided perhaps I should redo them, but as a video series instead. What I intend to do is provide a video for each part, using the current version 8. The differences are small and shouldn’t be a problem. This way the reader can choose the medium he/she best learns in. Or even use both as supporting material. One day I will update the written versions. So here is the result, Beginner’s SketchUp Tutorial Video Version–Part 1. After you have completed Part 1, and certainly no later than Part 2. See http://www.srww.com/blog/?p=1419 and http://www.srww.com/blog/?m=201102 . They may save you a lot of aggravation. A completed SketchUp model of the Bedside Table can be downloaded from my website srww.com. Select the Free Plans menu button, scroll down to Tables and locate Bedside Table from the list. It is available both in native SketchUp file format (.skp) and as a PDF file (.pdf). Before you view the video take time to familiarize yourself with its design and dimensions. For this first part we are especially interested in the tapered legs. You may want to print out the leg dimension scene(s) for reference. 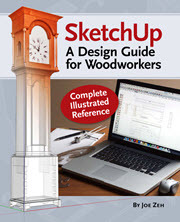 See you in Beginner’s SketchUp Tutorial, The Video Version–Part 2.